By crushing enemy turrets, players grant their entire team global gold and remove safety from the map, especially for enemy junglers. This creates strong pressure on the enemy team and gives your allies a chance to snowball without even winning their lane. This team specializes in two gate openers, one of them being the strategically-minded int Sion. Lucian [Marksman] - When it comes down to taking enemy turrets down convincingly with speed, Lucian is the one marksman that comes to mind. He could also be replaced by Tristana, but in the current meta Lucian's dueling abilities are far better. Anivia [Mid] - If your team is running around the map killing turrets, you'll want a champion mid-lane with high waveclear and excellent disengage abilities. For this set of criteria, nobody beats Anivia for the #1 turtling champion. Bard [Support] - Bard's role in this game is to quickly snowball his lane and also provide large-scale map pressure. He also greatly increases his team's movement capabilities, and can stall out objectives as his gate openers push down turrets. Udyr [Jungler] - The original gate opener himself, Udyr's speed and attack power make it very easy for him to take down turrets and get away for free. This team also sports strong CC and kill potential in all lanes, making Udyr highly effective as a ganker as well. Sion [Top] - By drawing immense pressure to himself, Sion can continuously push lanes without regard to his own death as long as he can take down objectives. If your team is really having trouble without a front line, he can also easily shift into a standard role while Udyr split-pushes instead. This team is not isolated to one strategy, but the key should still be crushing towers due to their immense damage output. Lucian has low peel in this team composition, so he should definitely go the Black Cleaver build to increase his durability. Countering this team mostly involves grabbing some high damage gap-closing champions and also high damage laners to take down Sion before he can do too much harm to your base. Talon [Mid] - Low peel on the backline grants an AOE assassin like this free kills all day. 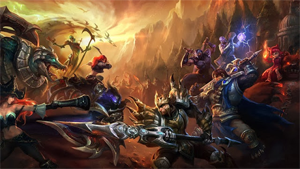 Gragas [Jungle] - High engagement potential is necessary to take down an enemy like Anivia, and he also doubles as a powerful crowd-control specalist if Sion is really giving a lot of trouble. Jax [Top] - If Sion wants to give your team free kills, pick up a high damage champion like Jax and take advantage. Pyke [Support] - When you combine his engage with his strong back-line killing capabilities, running Pyke gives your team strong engagement potential before Anivia can become too annoying. Miss Fortune [Marksman] - If Anivia steps up to use her ultimate, a well placed Miss Fortune ultimate can quickly show her which ultimate is stronger. Meanwhile, she's one of the few champions that can match up with Lucian mid to late game. Overall this counter team is also very strong, but with a less synergy and more direct damage.